Work: Member of the Colonial Assembly of North Carolina, 1766-75. 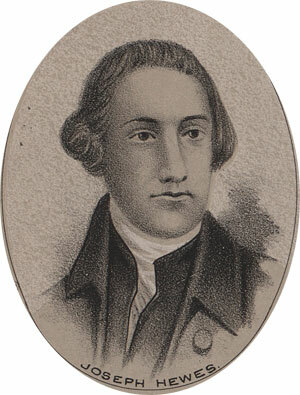 Member of the Committee of Correspondence, member of new Provincial Assembly, 1775; Elected to Continental Congress, 1774-79, Defacto first Secretary of the Navy. Joseph Hewes was born in Princeton, New Jersey and attended Princeton College. He established a shipping business in Wilmington, North Carolina in 1760 and, by the time of the revolution, had amassed a fortune. He elected to the Provincial Assembly in 1766 and served there until it was dissolved by the royal governor in 1775. He was appointed to the Committee of Correspondence, elected to the Provincial Legislature, and sent along to the Continental Congress in 1775. Hewes was known as a tireless worker in committee and the leading expert on maritime concerns. In 1776 he signed the Declaration of Independence and placed his ships at the service of the Continental Armed Forces. He served the Congress as the Secretary of the Naval Affairs Committee until 1779, when he fell ill. He died at age 50.